I am not too comfortable saying this because it sounds a bit braggy or even annoying to some, but I actually love my job haha. I use the Emily Blunt I Love My Job gif, but on a literal context. Our work allows our team to visit communities in far flung areas to help bring the benefits of technology and connectivity. 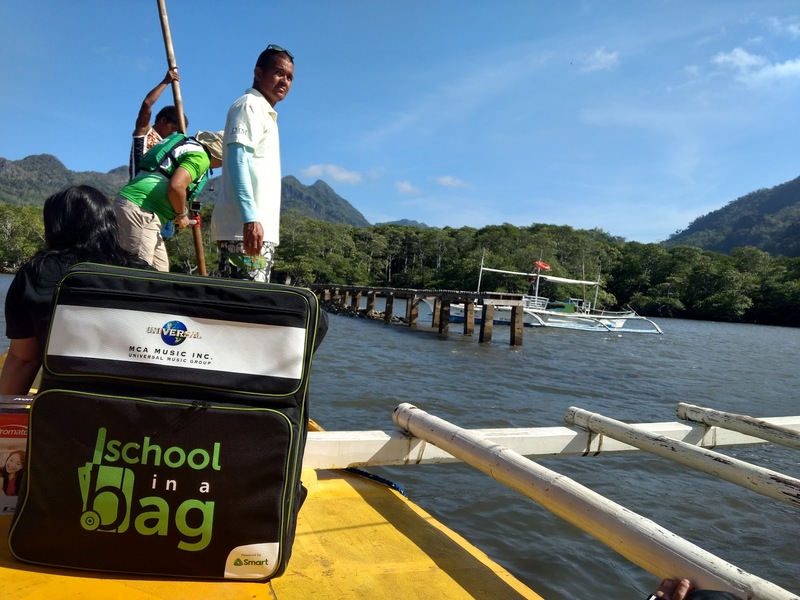 One of our most memorable assignments this year (so far) is the delivery of School-in-a-Bag sets to two public schools in two remote islands in the island town of Coron in Palawan. Smart's School-in-a-Bag is essentially a big backpack (yet still portable enough for a teacher to carry around) that contains a TV, tablets, a laptop, a smartphone, a Smart Bro Pocket WiFi kit, and a solar power kit (since these sets are donated to schools with no access to electricity). So it is really a digital learning lab in a bag. But more than just giving teachers and students devices, School-in-a-Bag actually comes with apps and learning modules that are aligned with the DepEd curriculum. Smart also provides training to the teachers who will be facilitating the digital learning sessions in their respective schools. We first went to Cabugao Elementary School with a bag sponsored by MCA Music Philippines (Universal Music Group's Philippine operations). The MCA bag was delivered by MCA artist Gabby Alipe who, incidentally, was actually looking for ways to reach out to communities. The School-in-a-Bag project was perfect for him since education and youth development are advocacies close to his heart. Here's a video from Cabugao, shot entirely with a Moto Z Play phone. (Shaky cause video was handheld, but the overall video quality and the vividness of colors surprised me). After the Cabugao visit, we went to Banuang Daan Elementary School where our group was welcomed with a program the teachers and students prepared. We're so used to having devices and access to content and information that we often forget there are students in the Philippines learning in schools that don't even have electricity. To the teachers and the students we visited, having been given a School-in-a-Bag kit means a lot to them. To the students, it means exciting, interactive and modern ways to receive and create information. For the teachers, it means finally keeping up with their curriculum which requires basic education on information technology. For the community, it means their children will now have a better chance when they step up to the bigger schools in the town's center. You can help bring more School-in-a-Bag or Technocart (carts that contain gadgets and educational module, for schools with access to electricity) kits to remote schools in need of a digital learning laboratory. If you, your company, your organization, your family, and even your group of friends is interested in sponsoring a kit, you may email technocart@smart.com.ph.